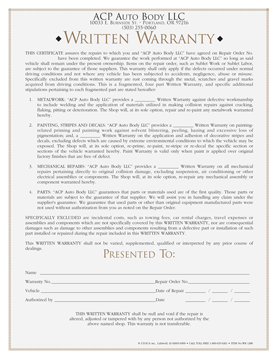 ACP Auto Body provides written warranty covering our workmanship for as long as you own your car. Your warranty will be honored at our location. We provide a written warranty against workmanship on the following procedures: welding, all structural work, metal and plastic repairs. Our paint work is guaranteed against peeling, blistering, hazing and excessive loss of pigmentation. This paint warranty is valid only when refinishing is done over original undamaged factory finishes or over original equipment manufacturer replacement parts. Specifically excluded is paint chipping caused by driving conditions. We also do not warranty any rust repairs or any rust related conditions. ACP Auto Body provides the very best services for your vehicle!